The Goddess's of the Tuatha Dhe Danaan are to many to number and list here,But I will list below the Goddess's that I can and their attributes. A Short list that pales in comparison to the Many names of the Goddess's in the Pretanic Culture. 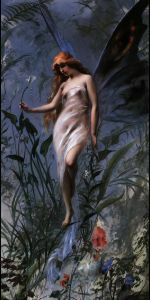 Goddess of the Lough Gur,Enchantress and Maiden,whom Brushes Her Hair by the Lough and awaits the Swan Poet Angus Og,whom takes Her up to His Place in the Fairy Realm and the Brugh.Hers is the Power of Magick of the Faerie and Sidhe. Goddess as both Maiden and Mother,Three-formed Lady of the Perpetual Flame.Woman of the Kells,Beloved Goddess who's companion is the Cat.Daughter of the Dagda,and the Lady of the Hearth,Forge and Mantle.Goddess of Battles and Warfare(Briga).Most Beloved of the Tuatha,and the Queen of the Sidhe and Protectress of the World.Picts Goddess that is the Holder of the Green-Fire.and Healer Goddess that weaves the Threads of the Fates for Cures and Death as a release. Considered to be the Mother of the Tuatha Dhe Danaan,(children of Dana)Yet Dana is both Maiden and Craftswielder The Goddess who births the Golden-Faerie Light from the Underworld and flows this unto the Realm of Man.The Creatrix and Spiritual Umbilical cord unto all Life that is active and flourishing.The Knotwork Pattern and theLines that create it are Hers.Not Much is known of Her but much can be gained by Worship and attunement with Her. Crone and Darksome Mother known by many names,The Queen of theKingship and Goddess of the Circles of Stone.Cold,Barren Stern Grand Lady of the Underworld and the Cauldron of Tirn Na naog.Croneof the Mountains and Bens,Kirks and Fields,Lady of theanimals Wild and Holder of the Thread of Life and Scythe that cuts it.Ruler of the Old Moon(New Moon)Woman of the Faerie Haunts and the Pathway Home again.Holder of the Maidens Light that renews in Herself as Herself again to be revealed. Warrior Queen of Conniaght,TheBattle Mistress and Faerie Queen that Battles the Ulster Hero CuCulaine and the Cow Goddess of the Battle Raid of Cooley.Holder of the Magick of both Light and Dark,Soveriegn Ruler of the Spaces between the Worlds,Leader of Champions and the Mist Laden Hillocks of the Blood Shed Moors. Tuatha Goddess of Three-Fold Eminations,Ruler of the Raven-Triskele and Spectre Queen,Goddess of the Shades and Phantasms of the Night,Samhain Goddess,Giver and Granter Of Victory.Raven of the Battle Fields Harvester of the fallen Warriors Acorn Crop.Tuatha Goddess of Fire and Rage,Revenge and Hidden Wisdom of the Witch.Yet in Her other Form as the Raven,She Prophesies and can become a Goddess of Peace.She is the Strength and Power that Tests the Mettle of the Celtic Soul. Maiden Goddess that tends to the Herbs and Holder of the Wisdom of the Magick of Healing,with the Herbs both Medicinal and Magickal.Tuatha Goddess that empowers the Life of the Herbs to work and weave wonders for the Goodness and kind sake of all mankind.The Power of the Gentry Flows through Her and She kisses and embraces the Herbs to grow with the Golden Light of Dana pushing up through the shoots and tends to the Life of Lugh Bristling the Herbs with Potency. Soon these pages will appear in their entirety,please be patient.and return often.